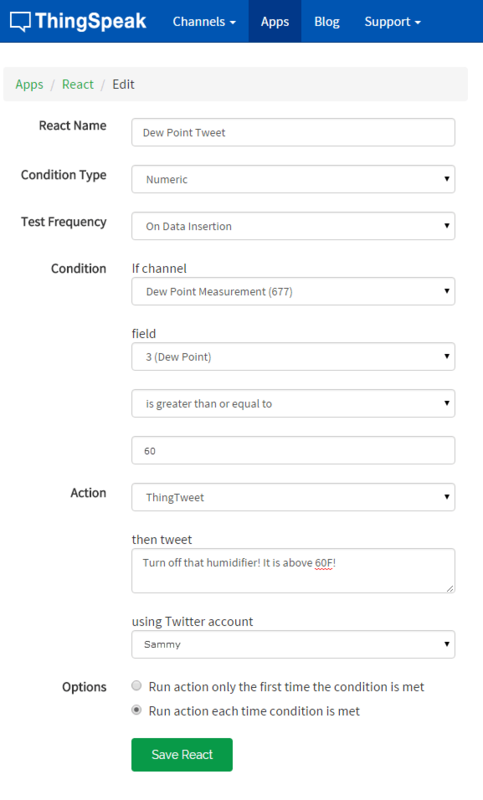 This example shows how to send a tweet when your dew point data exceeds 60°F using ThingTweet and React apps. Sign In either to your MathWorks® Account or ThingSpeak™ account, or create a new MathWorks account. Create a Channel as your Dew Point Measurement channel. Read the weather station data into your channel and Calculate the Dew Point. Go to Apps > ThingTweet. On the ThingTweet page, click Link Twitter Account to link your Twitter account to your ThingSpeak account. Enter your Twitter user name and password, and click Authorize App. 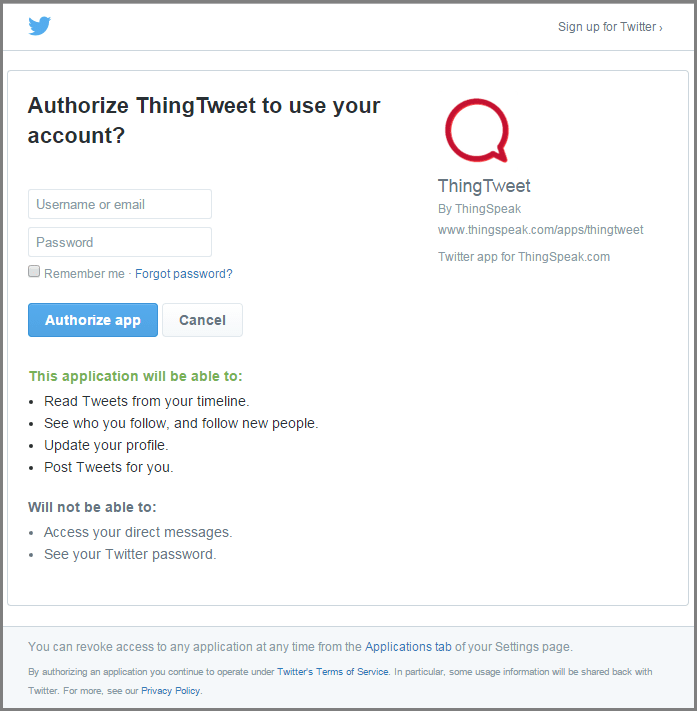 On the Authorization page, click Back to ThingTweet. 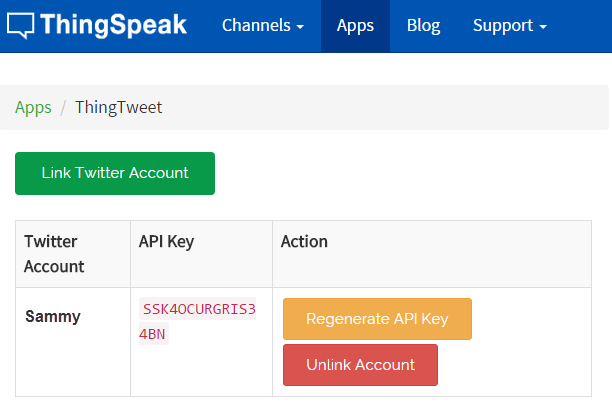 Notice that your Twitter account is linked to ThingSpeak. This example shows how to send a tweet each time the dew point level goes over 60°F by checking the channel every 10 minutes. Go to Apps > React, and click New React. Name your React "Dew Point Tweet." Set the Condition Type to Numeric. Set the Test Frequency to Every 10 minutes. 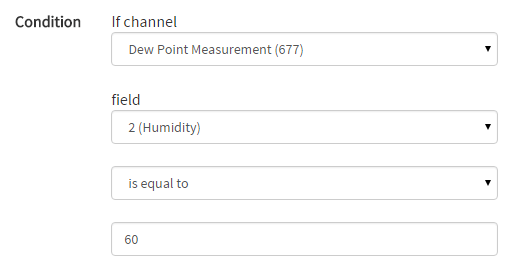 If channel: select your dew point measurement channel. field: select 3 (Dew Point). For the condition type, select is greater than or equal to. For the condition value, enter 60. Select your Twitter account in using Twitter account. In Options, choose Run action each time the condition is met. 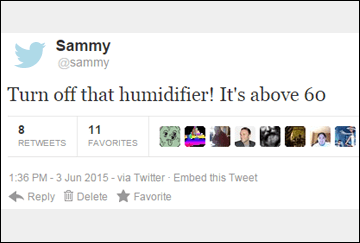 The tweet is sent every time the humidity level goes above 60°F.